So few Comfortable Places is out ! 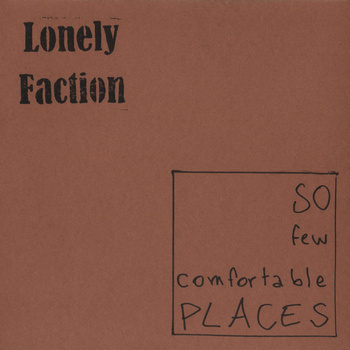 So Few Comfortable Places, Lonely Faction’s latest effort, is now on sale. We strongly recommend you, dear Internet wanderer, to take a moment for yourself and give it a listen. You can buy it, or listen to it, or listen to it then buy it, or buy it then listen to it, or buy it then listen to it then recommend it to a friend who will listen to it then buy it then… Anyway, click anywhere on this neverending gibberish OR on the picture above, you’ll see what i’m talking about. “So Few Comfortable Places” sortira le 29 février bientôt! Pour patienter : « Hush » , une cover des excellentes ALLIGATOR enregistrée il y a qq jours, en téléchargement gratuit. Leur premier EP est en écoute ici. Thanks to Nobrou for being a good boy and recording and uploading these few extracts of Lonely Faction’s latest show at La Lanterne, rennes (opening for David Dondero). Have fun watching them, and pay a visit to the Videos link if you haven’t yet. Here it is ! The brand new website ! Hurrah. This website, and all of its contents, is under a Creative Commons license. Please be nice and don't mess around with all the stuff that's on here, even though this is tempting. God is here to keep you away from these kinds of temptation if you are a lonely soul. And if you aren't, then let me ask you a question: why are you spending so much time on the internet? C'mon, we all are lonely souls after all.